In today’s sanitised, risk assessed, health and safety purified world it’s good to know that you can still rely on some nations to allow you, if you so desire, the opportunity to cause yourself serious harm or injury in the name of fun. The leaders in this high energy, adrenaline fuel death rides are the Spanish and the Japanese. These two countries offer you the best in death-defying mayhem. So if you are thinking of spicing up your holiday destination this year, what are the most dangerous festivals you can try. 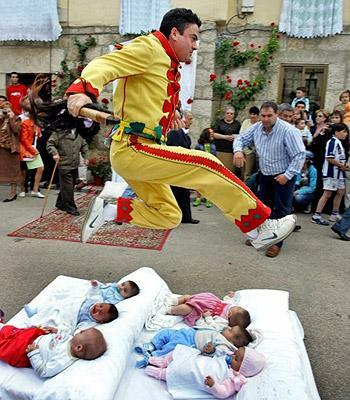 Baby Jumping… yes parents from the Spanish village of Castrillo, voluntarily put their precious newly born babies in the middle of the village street and men dressed in devil costumes leap over the newly born children from the previous 12 months. Although the origins of the festival are unknown the festival, carried out during Corpus Christi, is believed to cleanse the infants of original sin. The Danjiri are large ornate wooden shrines that teams pull at speed through the narrow streets of Kishiwada, Osaka in Japan. 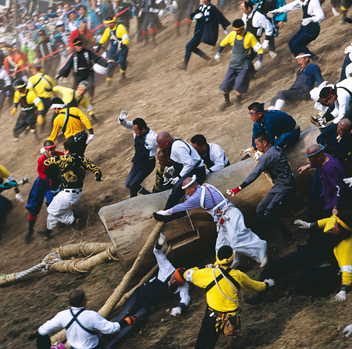 The teams prepare for months before race day on the 14th – 15th September, the 33 Danjiri teams then line up and with a shrill blast on a whistle each cart starts its run. Cornering is the most difficult part of the race, as they tend to skid around the bends at furious speeds. 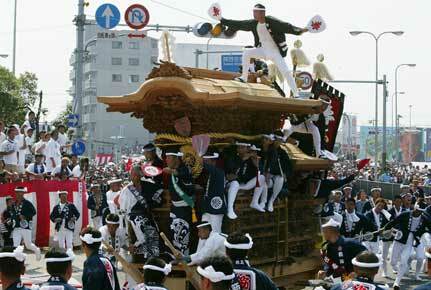 During the race a band and dancers attempt to play and perform without falling off, as the Danjiri completes its circuit of the town. Only in England could they turn an innocent looking cheese into a death race. 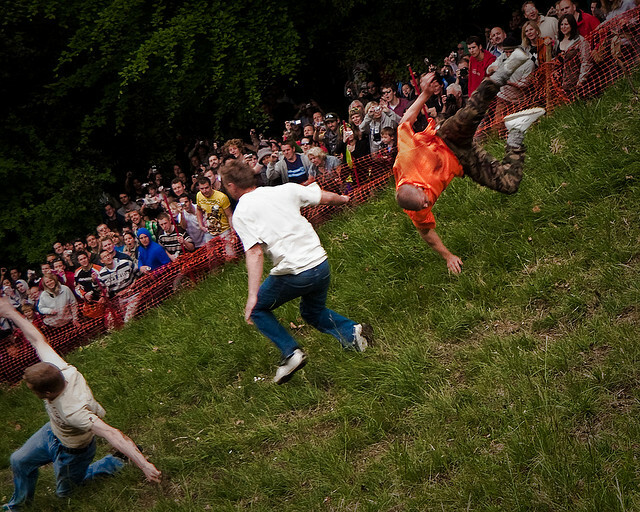 For the last 200 years every late May Bank Holiday thousands flock to the village to hurl themselves down the steep Cooper’s hill in pursuit of a Double Gloucester cheese. A fleet of ambulances is always in attendance to cart the injured competitors off to hospital. The Onbashira Festival has been held every six years for over 1,200 years and is a time when the temples of Suwa are symbolically renewed. The festival takes place over several months and the first part involves cutting down huge tree trunks, which are then dragged across land to the temple site. Parts of the route are through steep undulating terrain and it is here that the young men prove their bravery by riding the trunks as they hurtled down the hillsides. 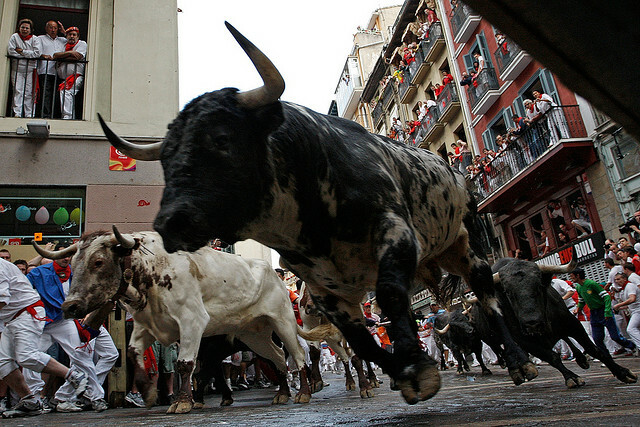 Carried out during the Festival of San Fernier for the last 600 years bulls have been let loose through the narrow streets crowded with crazy competitors who try to avoid getting trampled or gored. Made famous in Ernest Hemmingway’s novel “The sun also rises” it is now one of the most popular and dangerous thrill rides you can voluntary take part in. It has claimed the lives of at least 15 people since 1924 and many more have suffered, cuts, bruises, broken bones and concussion. This entry was posted in Festivals, Travel and tagged dangerous. Bookmark the permalink.